A couple of mornings ago we woke up to the sight of an ambulance stuck on the beach. Rosie, my lovely wife, was in need of an ambulance with medical attendants to transport a patient to Guadalajara. The drivers travelled through the night and sometime in the early morning arrived here in Melaque. Apparently they needed to stop and ask where El Palmar was located and were told we were at the end of the road. How that translated into driving out onto the beach is a mystery known only to them. We do know that Tapatios (people from Guadalajara) love to visit Melaque and its beaches. So, maybe they thought it would be a wonderful place to wait for the doctora, on the beach watching the wonderful sunrise. 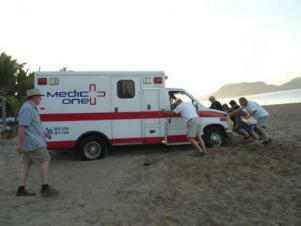 It's not the first time drivers have been lured out onto the sandy beach only to become stuck! So it was Johnny to the RESCUE. I thought with one heavy duty fishing line I have, that it might be possible to tow them out. I hooked them up and at the sound of my horn the ambulance reversed and I pulled. Halfway the line broke. But with another try and the help of pushers, we had them out. Little video here of us getting the ambulance unstuck.